A: Yes, please give us a call if you're wanting to arrive after 9pm. A: Yes, every room has undercover parking. 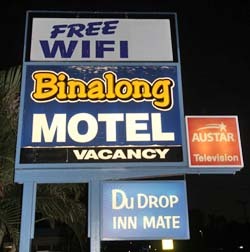 A: Yes, all rooms at Binalong Motel are non-smoking. A: Yes, for breakfast and coming soon, dinner. A: Yes, free Wifi internet access is available to all rooms. A: Yes, we have a BBQ area in the pool enclosure. A: We are just a short 5 minute walk to the main street and shopping precinct of Goondiwindi. Q: How close are you to restaurants/hotels? A: Goondiwindi boosts numerous fast food outlets and restaurants all within a 5 minute drive from the motel. A: Yes, in all rooms along with free to air channels. A: Yes we are pet friendly. Please advise us at the time of booking. Conditions apply. A: Yes a wide range of beverages is available at reception.